These easy fritters use moong dal / Mung dal which are split and skinned green moong beans. Moong Dal is often used to make dishes where chickpea flour is used, such as pancakes, fritters /pakora etc. Moong Dal is often called petite yellow lentils in grocery stores like whole foods. See Dal names and photos here. Mung Dal makes soft nutty fritters. 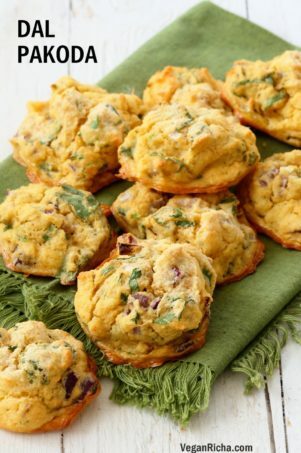 Add just onions and greens or add shredded veggies of choice to this versatile batter. 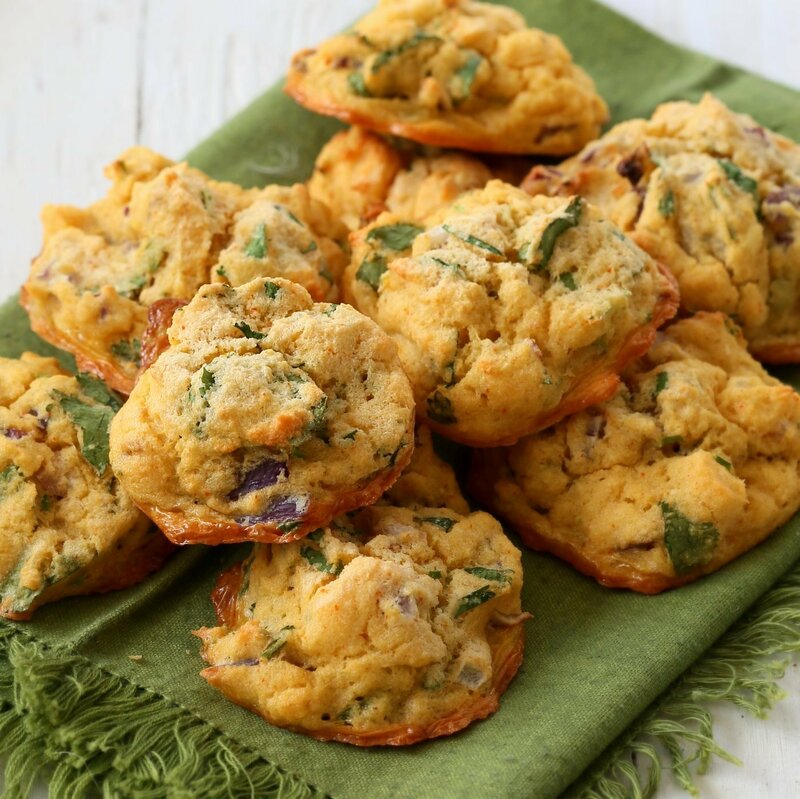 You can use red lentils (split red lentils) to make these fritters as well. Red lentil batter does not hold its shape as well. 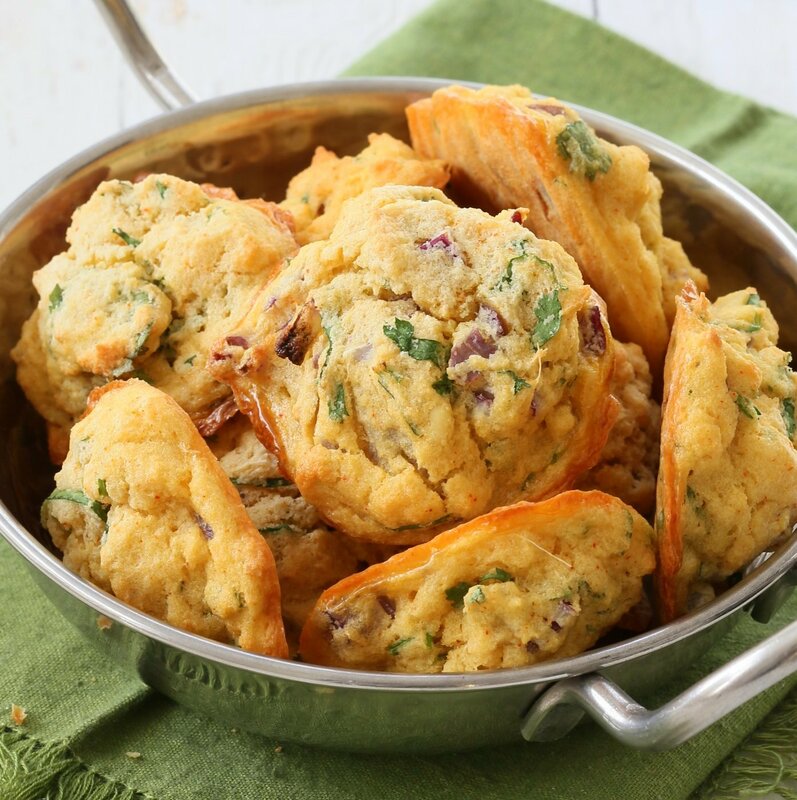 There are many kinds of pakoda/ pakora/bhajji/fritters in Indian cuisine. Some use besan(gram flour), chickpea flour, other bean or pea flour, some others use soaked moong dal or urad dal to make the batter. Some are simple spiced with cumin, mustard or carom seeds, some use have a tempering with curry leaves, and some others use spice blends. Most are deep fried. 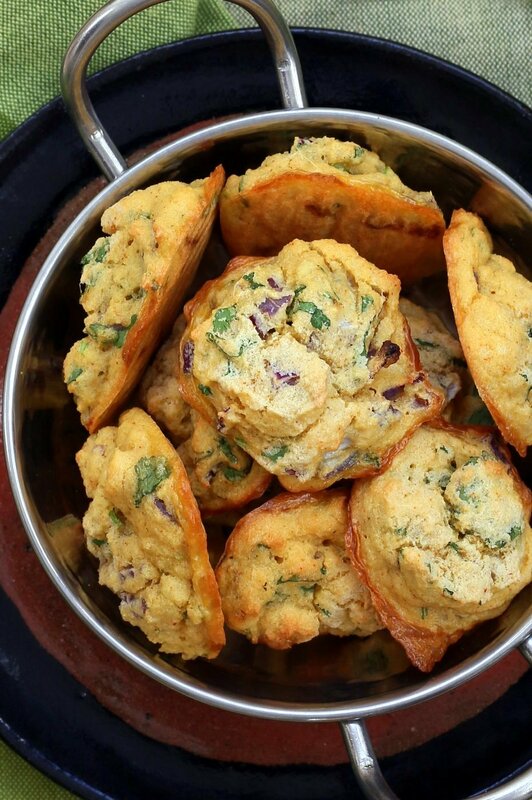 Make these moong dal pakoda for a change from chickpea flour fritters. Serve with Mint Cilantro Chutney or other chutneys of choice or with Kadhi (spiced yogurt sauce). You can also use the batter to make thin pancakes like chickpea flour pancakes and serve for snack or breakfast. Let me know in the comments how they turned out! Crunchy on the outside and soft inside. 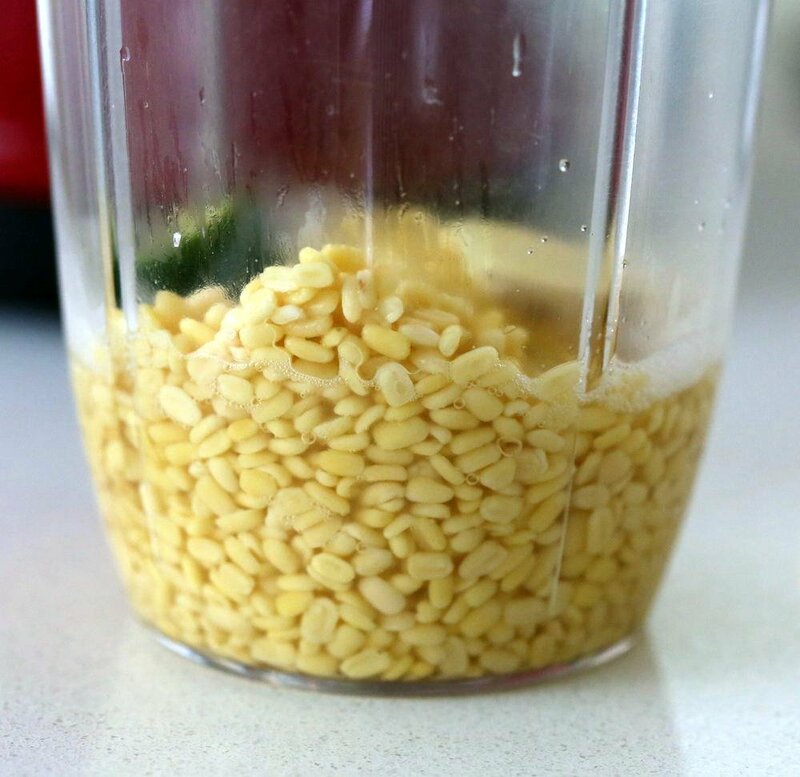 Soak the Mung dal in hot water for 15 minutes or 1 hour. Longer works best. 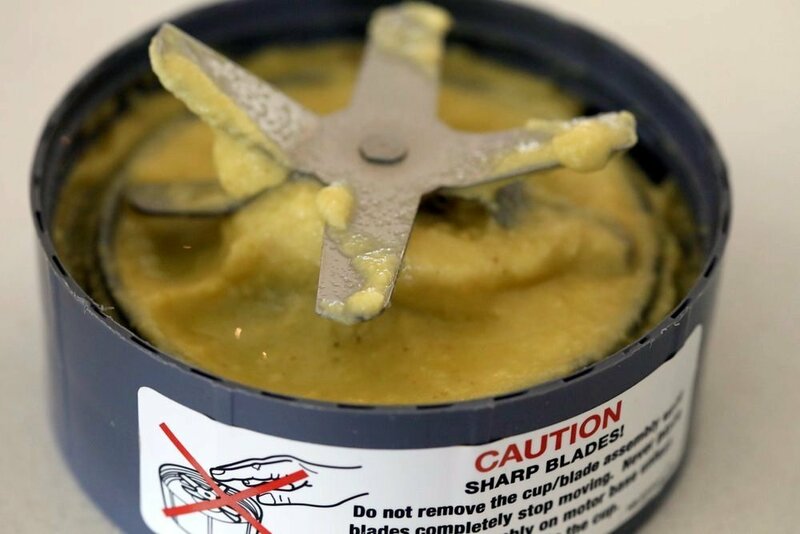 Drain and add to blender. Add ginger, chili, garam masala, turmeric, salt, baking powder, oil and 1/4 cup water. Blend to a smooth thick batter. Add more water if needed. Keep the batter thick so it can hold its shape while baking. Thinner batter tends to flatten. Pre-heat the oven to 425 degrees F / 220ºc. Add the chopped cilantro, greens, onion and garlic and fold in. 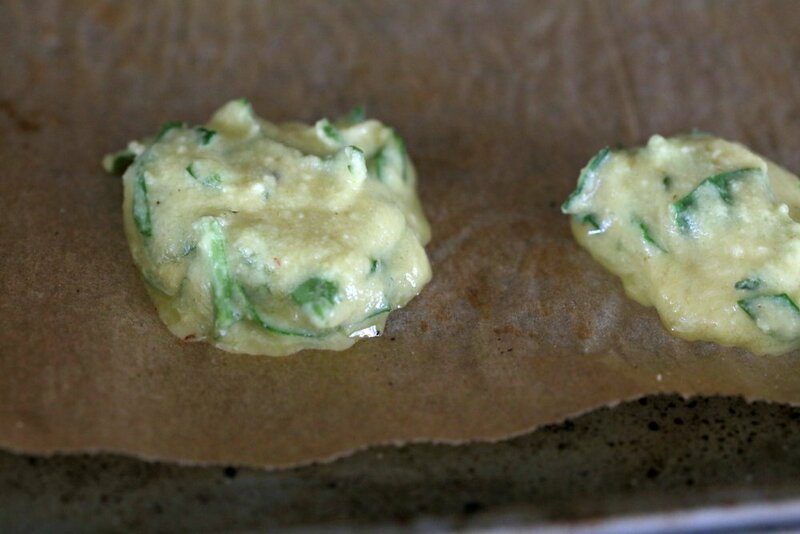 Using a Tablespoon or ice cream scoop, drop spoonfuls of the batter on parchment lined baking sheet. Lightly spray oil on top. Bake for 17 to 19 minutes until golden on the edges. Add sprinkle of chaat masala on the fritters (optional). Serve with chutneys Mint Cilantro Chutney or tomato chutney or ketchup or add to kadhi (non dairy yogurt sauce) or curry. Make these in aebleskiver/appe pan: Drop ladlefull of batter in a greased pan over medium heat. Cover and cook for 3 to 5 minutes, flip and cook for 2 to 3 minutes. For chickpea flour batter: Use 3/4 cup chickpea flour, 1 tbsp rice flour, 2 tbsp non dairy yogurt, 1/3 cup or more water to make a thick batter. Add minced ginger, minced green chile and spices from above. Fold in the cilantro, spinach, onion and other vegetables if using. Bake for 17 to 20 minutes. Make Moong Dal chilla/pancakes: Spread the batter on a skillet over medium heat. drop a few drops of oil on the edges. Cook until golden, flip and cook for a few mins and serve with ketchup or chutneys. in the ingredients it says the lentils should be soaked and in the instructions it says to soak them in hot water… is that a double soak? if so, how long should i soak them? Oh yes, its soaked only once. I removed it from the ingredients. soak for atleast 15 minutes and if you have time then for an hour. can i make the batter the night before? Yes, but keep the veggies (onions, greens) separate. Mix when ready to bake. I cooked moong pakora in an appe pan it turned yummy just like the fried ones. Baked one looks good. yes appe pan works too! Would it work in an air fryer? it should work fine. The texture might be slightly different. I can’t easily (as in I can’t get it anywhere close to me) get the yoghurt in South Africa. Any suggestions? you can serve it with chutneys. This recipe sounds reeeeally delicious. We want to prepare it at the weekend. Is it possible to freeze the Baked Moong Dal Pakoda or would they lost the taste or consistency? try to freeze a few to see. the texture should be ok, but in general a reheated pakoda will be dryer. Made these for dinner and they were great! Used red lentils and soaked for about 35 mins/cooked for 20 and they turned out excellent. I had some leftover vegan tzatziki sauce which was a perfect accompaniment. Thanks, Richa! Can’t wait to try this. Just ordered your first book, Indian Cooking. Can’t wait to get it next week! just made a double batch of those ( fried …) and they came out great ! I’ve always avoided these kinds of fritters because of the deep-frying methods, but I was awestruck by how these look like they were deep-fried even though they are baked! This is amazing, I have to try them out! This was a disaster. The “batter” almost broke my high tech power blender. I added extra water and still got warnings messages from my blender. I had to transfer to the “batter” my food processor and I still ended up with a dough. I was reluctant to add much more water than I already had because the recipe says to keep the batter thick. Between the fine chopping, the mess and doughy not very tasty baked balls I ended up with, I have to say this was not easy, nor was it worth my time. Vegan Richa has never let me down before. I think some pictures of the batter may have been helpful, but I can’t figure out why this went so badly. Hmm, I am not sure what happened. I use both a Nutribullet which is a small blender and Blendtec which is a high powered blender without issues. Many people also made this on Instagram with almost similar looking results. Maybe you used a different lentil? Did you use Moong Dal? Or maybe the lentils were really old and did not soften on soaking. With harder lentils or things which take longer to cook such as whole lentils, whole chickpeas, split peas etc. The beans dont soften enough to blend and might jam up under the blender blades. I will add pictures of the batter in a day or so. I think the flavor and texture was doughy because of the blending issues. Can you message me (on social media) or email me the pictures if you have them so I can troubleshoot better. Thank you for your response. I didn’t take any pictures. I used a high-powered blend tech and I bought the correct lentils recently from a bulk bin. I am thinking the lentils could have been old, but I soaked them for an hour and my “batter” wasn’t gritty. i’ll add photos tomorrow so you can compare. Maybe the lentils needed a bit more water or they were pretty old. The above points are what I can think of for the issue. even with less water the mixture is generally a smooth slightly stiff batter. Made these for lunch and served with chutney and roasted veggies. Fabulous! This is an awesome recipe Richa. Super yummy! My husband and my son want these for breakfast every morning now with tomato onion chutney. I added diced potato to fill them up more so they wouldn’t eat them so fast, and actually, the potato makes a nice addition. Thanks very much for the recipe. A new staple in our house! Hi how much water do you use to soak? Just to cover or more? Can’t wait to try! Wonderful Recipe!! It turned out awesome! So easy to make. Very nice instructions. Very tasty with the least oil possible. all your food looks good. i hope you can help me with my question. its so hard to find recipes thats use the ingredients already ground and store bought. do you know any websites that use the flours vs. beans? or is there a way to convert your recipe suing mung bean flour and lentil flour which is just sitting. the flours work in some recipes and dont work in some recipes. 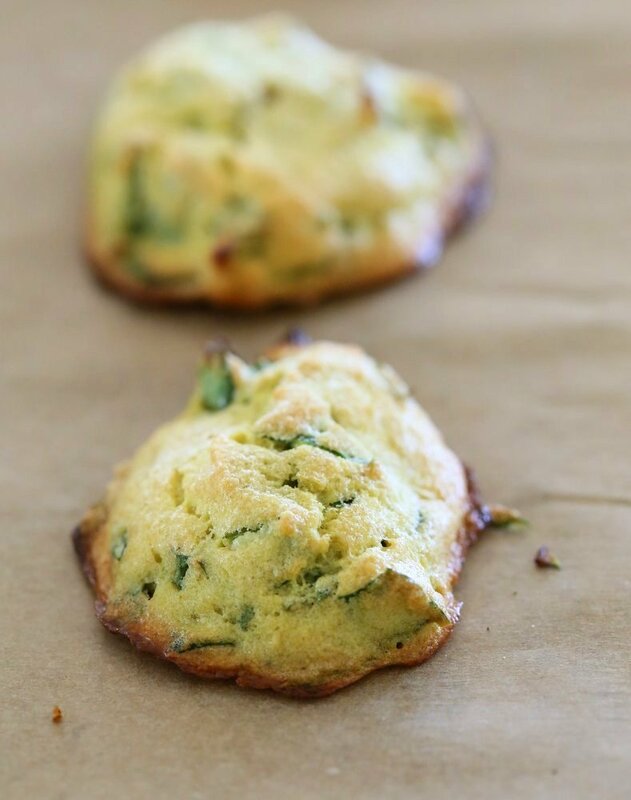 You can make a thick muffin like batter with the flour, ad the salt, spices, onion and greens and bake it. The fritters will bake a bit faster so check earlier. Mung dal flour is not easily available while the beans are. If you have flour available then you an generally use it in similar recipes. I made these over the weekend as a snack to bring camping. They are so delicious, and so easy! I used a 1/4 cup scoop for bigger fritters. I also made the cilantro mint chutney as you suggested – also amazing! I want to put it on everything! Initially I found the chutney to be a bit too thin (I’m wondering if it would have been better to use the food processor) so I added quite a bit more cilantro (probably an entire bunch), some spinach, and yogurt. It was the perfect snack to have on the road and in our camper!